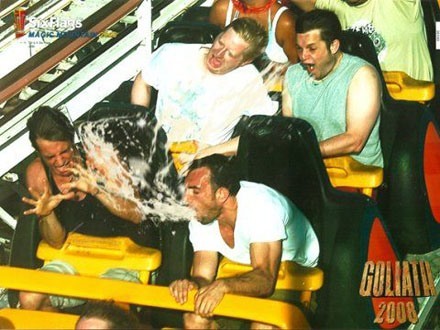 Have all of the jackasses and me do the "milk challenge" (where you drink a gallon of milk it makes you puke every time) before going on a roller coaster. while going down the big hill we all gag ourselves and puke. since were going down the hill all the puke will fly backwards and hit everyone behind us. All the jackasses will be bathed in puke and the passengers will get hit too. Getting puke on them will make them puke too. It will be a beautiful vicious circle of puking!